Sunrise, FL – Third time’s a charm! 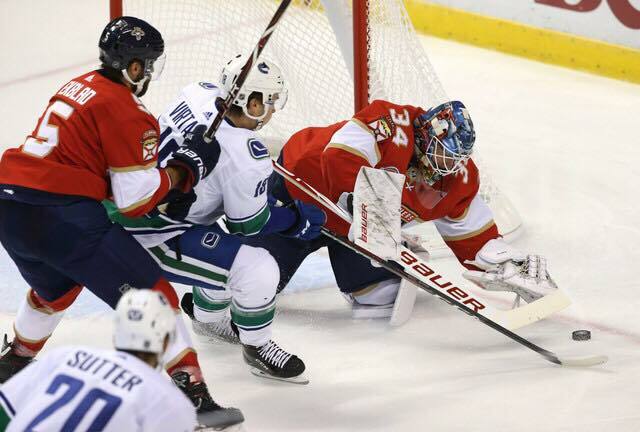 The Florida Panthers look for their 1st win of the season as they take on the Vancouver Canucks. Vancouver is coming off a win versus our neighbors to the west, the Tampa Bay Lightning. The Canucks sport a record of 2-2-0 heading into this game. Tonight, the Cats are celebrating their 1st Legacy Saturdays of the season, in honor of Roberto Luongo’s 1000th game, played back on April 5th vs. Boston. He, of course, got the W. Luongo is only the 3rd GK in NHL history to reach the milestone. The Panthers’ seasoned vet has been out with a lower-body injury, so James Reimer (Optimus Reim) got the start. The Panthers outshot the Canucks 11-9 in the 1st period, but couldn’t take advantage of their five-plus minutes of power-play time. The 2nd period was a rollercoaster of emotions! I felt like Katy Perry, Hot N’ Cold. Florida opened up the score in minute 7:29, when Jonathan Huberdeau, assisted by Vincent Trocheck found the back of the net. However, less than a minute later, Troy Brouwer was penalized for hooking and Elias Pettersson scored a power-play goal for Vancouver. The Cats shrugged it off, and worked their way back, taking the lead once again in minute 2:40 on Trocheck goal, assisted by, who else? Keith Yandle! He led all Panthers defensemen last season in assists. Caught sleeping, defensemen Bogdan Kiselevich was called for a hooking penalty against Antoine Roussel, and the Canucks were awarded a penalty shot that Roussel converted. “You’re hot then you’re cold. You’re yes then you’re no. You’re in then you’re out. You’re up then you’re down…” You know the rest. Where’s Left Shark when you need him? The Cats fell to the Canucks 3-2, and once again, it was their defense that couldn’t hold the lead. Let’s hope this isn’t a theme this season. Next up, the Panthers travel to face the Philadelphia Flyers, Tuesday, October 16th. Puck drops at 7 PM.